The ancient Dark Jedi Master spirit felt the call to the Spire once more. He had guided the Dark Jedi Knight Ashaiya to become a Dark Jedi Master and felt compelled to do so once more with another candidate. Dark Jedi Knight Jacob Murano's dedication to the Dark Side shone like a beacon in the galaxy and called forth the need for a trial of his abilities. At their first meeting, Dark Jedi Master Kerr would assess if Jacob was indeed worthy of his teachings. The ghost had high standards and would not continue if he did not feel it would benefit the Dark Jedi to promote the Dark Jedi Knight to a leadership rank. Only time would tell... A suggestion had been placed in the Dark Jedi Knight's mind to meet the Force ghost in the Valley of Ternaax on Rannon. Jacob sat alone in his quarters meditating. Finally he'd begun to allow the balance between the abyss and the serenity that he'd known to finally take hold. After the explosion which took the lives of those in the church and the orphanage the Knight had finally felt some peace. It took quite a bit of time but he finally felt better with himself. With everything in general. For a long while he felt the darkness pulling him closer to losing himself. Losing his balance as a Dark Jedi. Though help from Nissa made him see that he could finally grab hold of that balance and not lose himself in the swirl of emotions and chaos that was his life. Then he felt this pull. Like someone or something calling to him. Opening his eyes he then left his quarters as the presence made the suggestion and he would answer in kind. Walking to the hangar he then asked for a ship to take him to the Valley. It was obliged and soon he headed off for it. Thinking of what possibly could be there he then closed his eyes and kept meditating. Soon, he would find out what was bringing him there. Stepping off the ship he then made his way to the Valley and felt that presence again. If this was a ghost he knew them too well in fact. He'd seen his parents, and those of the dead who'd come and gone in his lifetime. Those who'd died among the ruins of the church and orphanage he saw recently. Their voices at times screamed into his mind for him never to forget. He couldn't nor would he be able to for a long long time. As he kept traversing through the valley he felt the presence more and he then stopped moving. "Who among the dead is here?" Jacob called out his orange eyes scanning the area. The ethereal Force Ghost shimmered into view and floated past multiple tomes and artifacts of the Dark Jedi, items that would be utilized in the test. 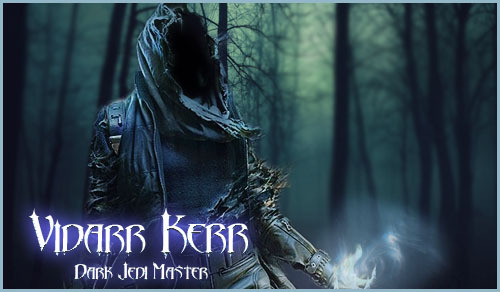 Dark Jedi Master Kerr stopped before Jacob, hovering just above the decayed ground covering. "Death is merely a state of mind..."
A cackle echoed all around them as the ancient Dark Jedi Master paused before speaking once more. "Dark Jedi Knight Murano, I have summoned you here to face the ultimate trial. A trial that will test if you are worthy of walking the path of the highest level Dark Jedi. I have been monitoring your accomplishments in the Dark Side thus far and while you have made admirable efforts, I seek the irreproachable. Are you ready to be judged?" Jacob then saw the shimmer of the Dark Jedi Master and snorted briefly. He should have known, not that it bothered him really or intimidated him. The Knight had seen his fair share of the dead, either ghosts of his past or ghosts of recent death and unnecessary destruction. Though now he remembered where he was exactly, Rannon. A place that his friend and fellow Dark Jedi, Rel spoke of. A place that was nearly wiped out of existence. Sure, it stood now but in serious decay, the ground itself proved that as did the dead wandering about. Even the one who was speaking to him, saying that death was a state of mind. "Not if you've been there." Jacob said with a half smirk, "Existing with the memories of a dead man. Funny how that works." Watching the ancient Dark Jedi hovering over the decayed ground he then blinked his orange eyes as the cackle rang out. Again, it served nothing to bother him at all. He'd seen and heard worse from even living people. The Dark Side was present here he knew that, just as it was on Ruusan. It was the Force here and it seemed that life may have died here but the energy of the Force didn't decay nor die it was here, strong as can be. As the Dark Jedi Master spoke, he then stood firm clasping his hands behind his back. Listening intently to the Dark Jedi's words. As he asked if he wanted to be judged, as his accomplishments were admirable, Jacob nodded his head simply, "I am. Give me your judgement, ancient one." "My judgement you shall indeed receive..."
Swirling all around them, scenes from Jacob's memories begin to play. Friends, family as well as foes all flash before their eyes. 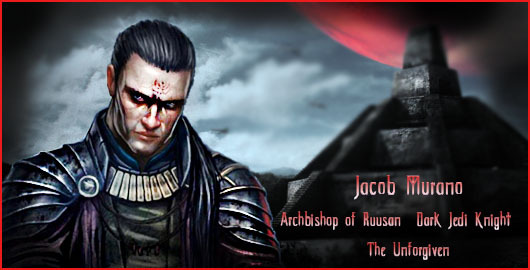 As the images fade and fall away to the ground, a shimmering darkness swirls around Jacob. "In your path to the Dark Side you have lost and you have gained. What have your experiences revealed to you in terms of your personal growth and power?" Jacob saw memories of his past play out briefly in front of him. Everything from his days as a Jedi to now formed in front of him then faded away as if just fluttering butterflies. A brief smile formed his face before it faded like the memories. Looking to the ancient one as the shimmer appeared around him. He'd had many experiences with the dead and this was no different to him. Jacob saw thousands of them in front of him before. Some he'd recognized and some he didn't. There were some who were family and friends and then those who were enemies. All in the blink of an eye he saw them then they faded. Then just silence. As the Dark Jedi Master spoke he canted his head for a second, "I have, yes. In terms of personal growth...up until recently I'd lost my way...my sense of balance." He then began pacing back and forth, "I was ready to give into 'The Night' as I called the darkness. Things had happened to me that I nearly lost it. I've seen both sides of the coin. Neither were my path...I'd known since I came to Ruusan those years ago that I wasn't completely dark...nor light. I knew I had to be aggressive, show what the Jedi would not, and be not what the Sith claim to be. Senseless destruction for what? What point? Anyways...it took a few to help me gain my sense of balance. In ways I grew in power that I had not known I had." The Knight stopped, "I couldn't save those who perished recently. I had a vision of it before it happened but I ignored it. No longer will I do such things. It nearly cost me myself, I nearly lost control. But, I have grown from that and learned to listen. I hear the dead still...but I've learned from my mistakes." The Dark Jedi Master watched and listened to the Dark Jedi Knight before him. Unbeknownst to Jacob Murano, the abrupt exit of the current leader of the Dark Jedi fold had placed an even more urgent need for the trial. Dark Jedi Master Kerr needed to complete this trial with expedience. "Excellent. You have passed phase one of the trial. For phase two, I want to address your skills in the Dark Side. I would like to know what skills you will seek to add in the future after you attain the rank of Dark Jedi Master and how these skills will further the power of the fold. And for the third and final phase of the trial, I want to hear your plan for how The Dark Spire of Ruusan could evolve and grow its membership in the galaxy. Tell me where The Dark Spire of Ruusan has come from and where they should go in the future with regard to recruitment, training, and missions."